Again? The Xiaomi Redmi Note 6 Pro has been officially unveiled in the Thai forum at Mi.com, but it still doesn’t feel like a proper launch (there’s no mention of the phone outside of the forums yet). Anyway, this is advertised as Xiaomi’s first phone with 4 AI cameras. 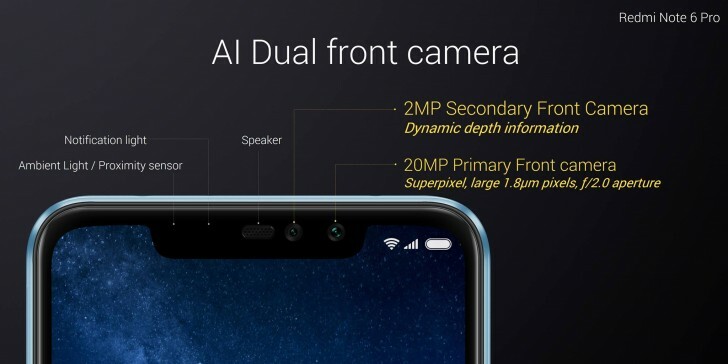 It’s the company’s first phone with two dual cameras of any variety, but where would we be without buzzwords like “AI dynamic bokeh” and “AI portrait 2.0”. The rear dual camera uses 12MP main module plus a 5MP depth sensor. 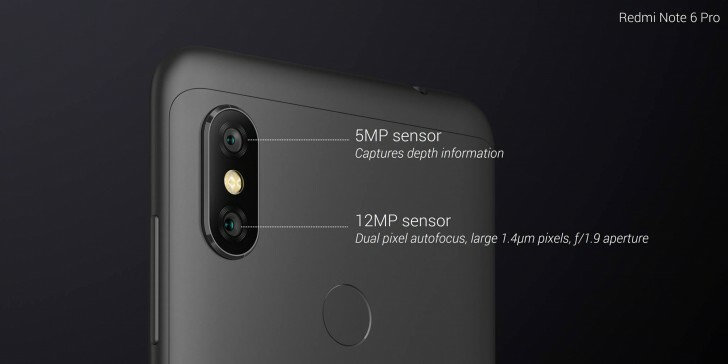 That may sound similar to what the Redmi Note 5 Pro had, but the new features here are larger pixels (1.4µm vs. 1.25µm) plus brighter aperture (f/1.9 vs. f/2.2) and Dual Pixel AF. Essentially, it’s the dual camera from the Redmi Note 5 AI Dual Camera. The selfie camera is different, however, it sports a 20MP main sensor (with 4-in-1 pixel binning) and a 2MP depth sensor. The other new feature is the screen – now a 6.26” IPS LCD with a notch. Xiaomi boasts that the Redmi Note 6 Pro has 86% screen-to-body ratio. The screen promises 500 nits of brightness and is guarded by 2.5D Gorilla Glass. Then there are things that have not changed, starting with the Snapdragon 636 chipset. Keep in mind that this is a THB 7,000 phone - $215/€185. 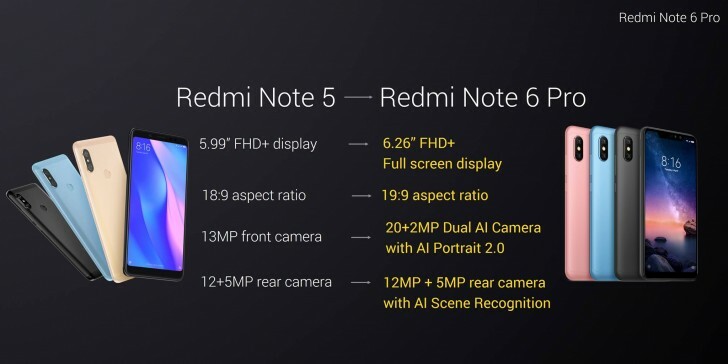 That’s with 4GB of RAM and 64GB storage (meaning it matches the cost of a Redmi Note 5 AI Dual Camera with the same memory setup). Also, the 4,000mAh battery is the same as before and again you won’t hear us complain about it. It promises up to 6 hours of gaming or 8.5 hours of video playback. 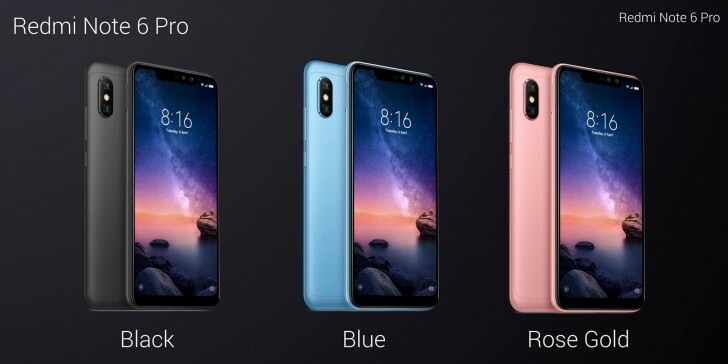 The Xiaomi Redmi Note 6 Pro comes in the standard Black color, but also Red, Pink and Blue. It has a metal frame with plastic panels (top and bottom) for better wireless connectivity. PS. Redmi Note 6 Pro pre-orders in Thailand score a free Mi Band 2. Alternatively, you can get a free Mi Wi-Fi repeater or Mi Selfie stick. I also have the phone. Just relax, the phone only launched September/October. Probably developers are busy with ROMS.